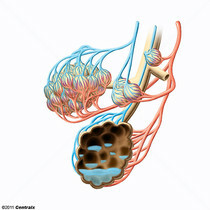 Either of the pair of organs occupying the cavity of the thorax that effect the aeration of the blood. 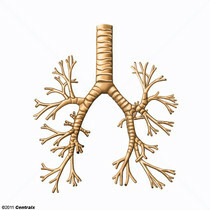 The larger air passages of the lungs arising from the terminal bifurcation of the trachea. Water present within the lungs; its volume is roughly equal to, or a little less than, the intracellular blood volume of the lungs. 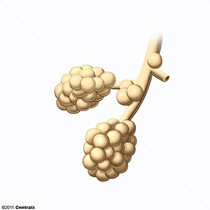 Accumulations of extravascular lung water result in pulmonary edema. 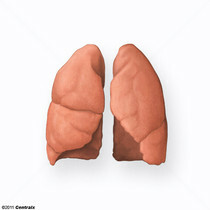 Small polyhedral outpouchings along the walls of the alveolar sacs, alveolar ducts and terminal bronchioles through the walls of which gas exchange between alveolar air and pulmonary capillary blood takes place. The barrier between capillary blood and alveolar air comprising the alveolar EPITHELIUM and capillary ENDOTHELIUM with their adherent BASEMENT MEMBRANE and EPITHELIAL CELL cytoplasm. 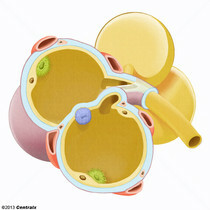 PULMONARY GAS EXCHANGE occurs across this membrane.